Steam Early Access release on August 10th! It is our great pleasure and honor to finally announce that Gangs of Space will be released on Steam Early Access this Thursday, August 10! Gangs of Space lived many lives and undertook many changes. We hope that the journey was an interesting one to witness, even though it was way longer than everyone could have expected - us included! You can already access the Store Page, wishlist the game, and join the Steam Community too! So… Let’s take a moment to explain the definitive pricing model of Gangs of Space. The game will release as Free to Play. Everyone will be able to download it on Steam, and access the entierety of the game content (all items, all ships, all enemies, all areas…). 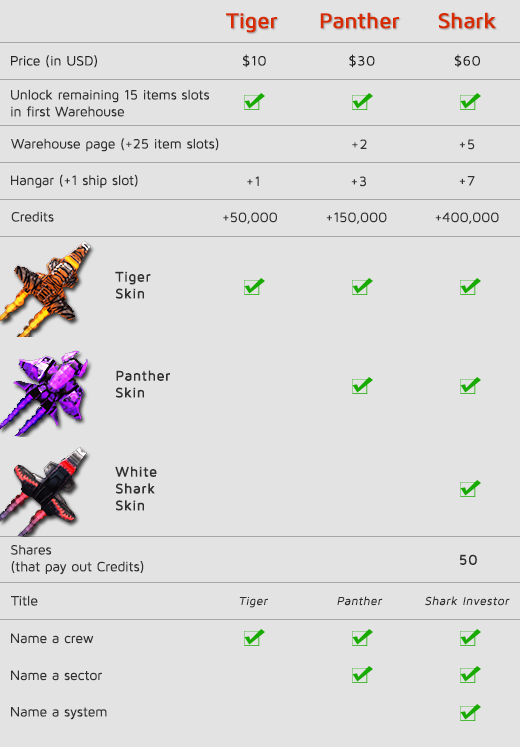 The only “limitation” for free account will be inventory & Hangar space: 10 item slots in the Warehouse and 2 ship slots in the Hangar. This is very reasonable to discover the whole game. If you want to support the development of the game, we will sell 3 packages as Steam DLCs: $10, $30 and $60 (or the equivalent in your country’s currency). These packs will contain Warehouse & Hangar slots, exclusive Skins, Credits, and a few bonuses like titles or the ability to name some content of the game. Whether you are a Gangs of Space fanatic or are just having some casual fun from time to time, we hope that the game will continue to bring you some good time. And since the game will be completely free to enjoy, don’t hesitate to send this page to all your friends, and create a Gang together: Gangs of Space on Steam.